About a week before Christmas I made an improvised, ad hoc, but really tasty supper of buttery braised cabbage, chestnuts and crispy pancetta. Enlightened and wanting to experiment more, I furrowed around in my favourite books and found many of my favourite writers singing the praises of similar combinations and more importantly, sharing all these delicious sounding recipes; A recipe from Auverge in France for cabbage, chestnuts and crispy bacon; Another for cabbage and pork cooked really slowly so the flavours melt together; Madame Glon’s recipe for chou farci, stuffed cabbage; An intriguing Northern Italian recipe for cabbage loaf. Then last Thursday my brother Ben called me from London. Ben and I invariably talk about food and Thursday was no exception. First he asked eager questions about broccolo romanesco and got excited – as only family members can – about my post for pasta e broccoli. He raved about a dinner at Le cafè Anglais and last but not least, he recounted with the enthusiasm of a labrador puppy that had just found a very large bone about making a chou farci or stuffed cabbage, better still, a sausage and cabbage cake. A sausage and cabbage cake indeed ! I’m sure if I hadn’t had my pre christmas experience with the braised cabbage or it hadn’t been Rowley Leigh’s recipe via my brother, Good taste both of them, I might have been less enthusiastic. But I had and it was, so it seemed like fate. 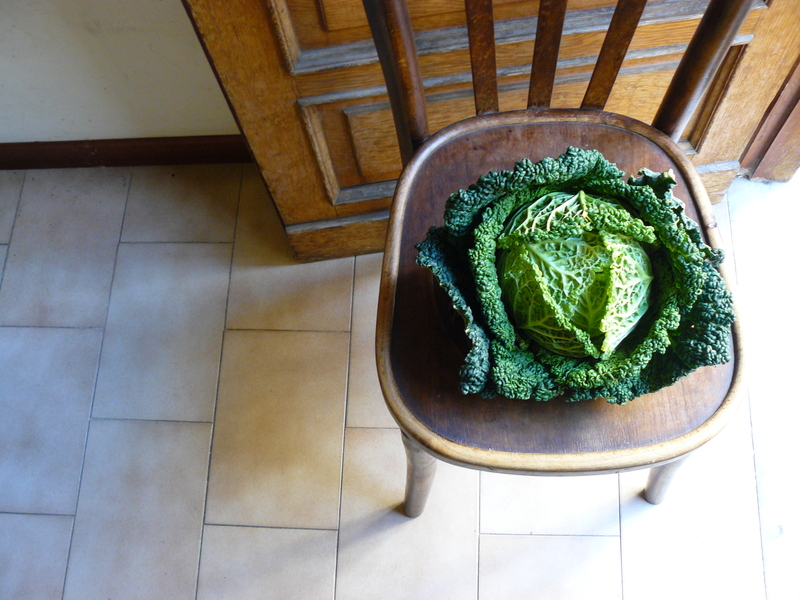 To top it all, I’d just bought the rather handsome savoy cabbage at the market, the one above, perched on the chair in the precious winter light. So I made it. Then I made it again on Saturday, just to be sure. I have to say this is one of the most surprising and satisfying things I’ve made in a while. 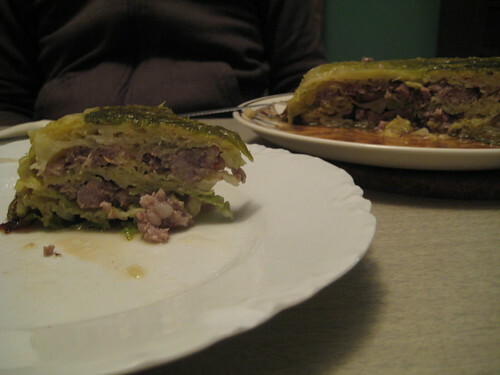 It is, as the name suggests, a cake of cabbage and sausage. You could call it a cabbage and sausage pie I suppose, the cabbage leaves in lieu of pastry and a layered filling of sausage meat and cabbage. Maybe it will help if I explain how you make it. You choose about 7 of the larger outer cabbage leaves and blanche them in boiling water for a couple of minutes so they are floppy and wonderfully accommodating. Then you lay the largest and most handsome leaf in the bottom of a round well-buttered oven dish and then arrange the other 6 leaves so they cover the sides of the dish, they should be fanned out, really overlapping and hanging over the edges. I remember Molly once suggesting you could wear blanched kale leaves as a cape, I think you could make a rather wonderful, very eccentric skirt from these gloriously, floppy green leaves. You chop and cook the rest of the cabbage, season it with salt, pepper, fennel seeds and olive oil. 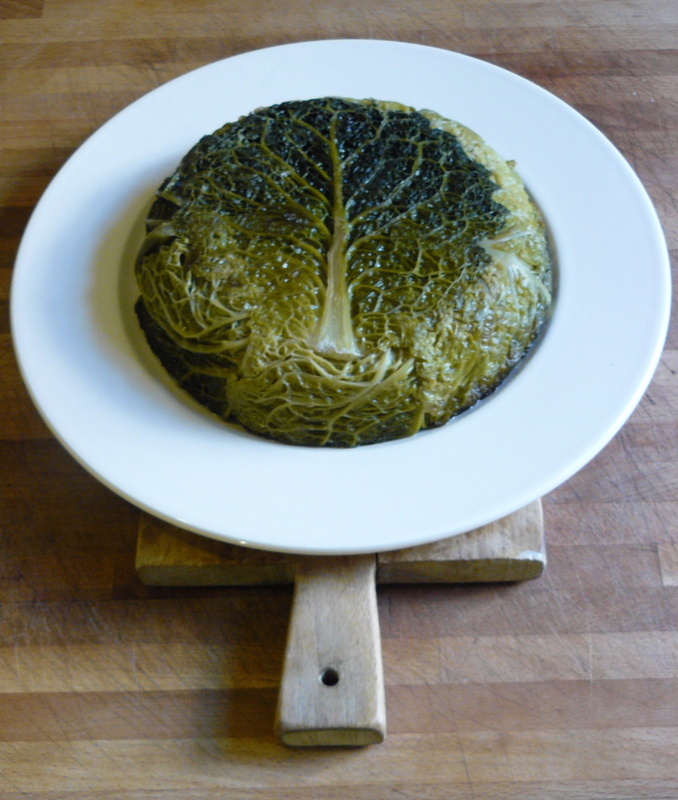 Now you make a bed of this seasoned cabbage at the bottom of your rather charming cabbage lined dish. Now the nice bit, you squeeze the sausage meat out of its casing and press half of it into the dish, it is of course easily moulded. Now another layer of cabbage, then another of sausage meat and a last of one of cabbage, you press the mixture down with your hands. Finally you bring across the overhanging cabbage leaves to cover the top and make a neat parcel and press again. You dot the top with butter and slide it into the oven for an hour. In the oven the cake cooks into a wonderfully compact and tidy parcel, solid and firm. You might want to woop with joy, it is so perfect and unexpected, You let it cool a little and then invert it onto a plate, no fear of sticking, and you have a savory cake topped with a leaf pattern, rather like an old, majestic oak tree. You slice into the cake, each neat slice is rather pleasing with its stripes green, pink, green, pink, green, playful really, I made some very creamy buttery mashed potato to go beside it, just right for a very cold friday night. The taste, well, its strange that an unexpected shape seems to change the taste of something very familiar. 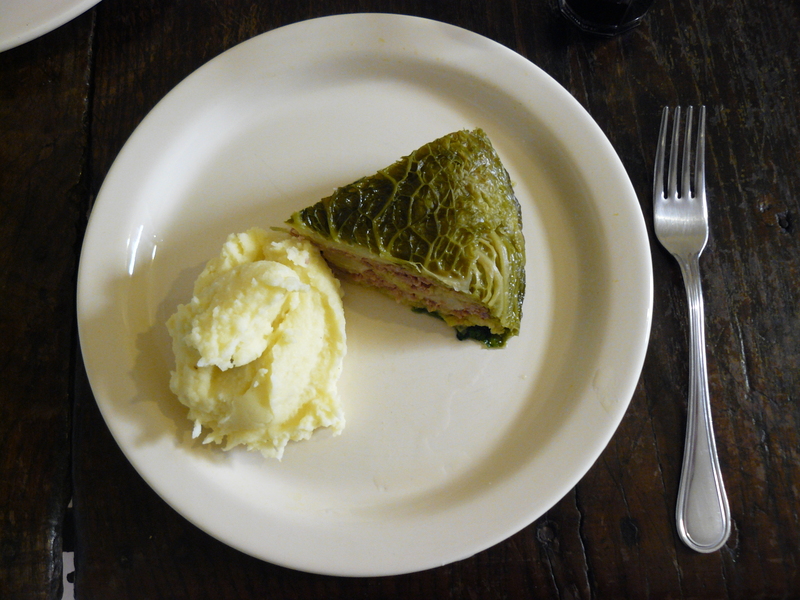 Yes, it is only buttery cabbage and sausage meat, but the cake shape with a tree on top, the happy striped wedge on the plate somehow makes it all the more delicious. ‘This is real comfort food’, I found myself muttering, ‘elegant too’. I might have even said ‘What a wonderful play on a classic supper of sausages, mash and buttered cabbage’, or something like ‘So very clever, so very simple, why didn’t I think of this’. And then I cut myself another slice. So to the recipe which is Rowley Leigh’s very simple way of making, moulding and serving chou farci (stuffed cabbage,) a much loved but rarely seen piece of French peasant cookery. Quality of sausage meat is really important: a good Toulouse sausage or the Italian luganega both work well as does lean English Cumberland sausage, you simply squeeze the meat out of the casing. Ask your butcher for advice. The fennel seeds are optional, I love the hint of aniseed in this dish (I am normally notoriously funny about aniseed) you may not. Remove 7 of the large, handsome outer leaves (discard any that are discoloured or damaged) and wash them carefully. Bring a large pan of salted water to the boil and drop in the 7 leaves. Wait for the water to come back to the boil and then blanche the leaves for 2 minutes. Using a slotted spoon remove the leaves to a colander in the sink, rinse with very cold water to fix the colour, drain and then spread out, flatten and dry the leaves carefully on kitchen towel. Set them aside. Cut the rest of the cabbage (the heart) into quarters and bring the same pan of water back to the boil, Drop the four quarters into the boiling water for 5 minutes by which time the cabbage should be tender but the stems still firm. Drain the cabbage quarters, rinse with cold water, drain again and squeeze out access water. Cut away the hard central stem and separate the leaves into bowl and dress with the olive oil, fennel seeds, salt and freshly ground black pepper. Squeeze out the sausage meat from the casing. Take a round, flat, 20cm oven proof dish and smear it with half the butter. Choose the largest and most handsome leaf from the 7 you have set aside and place it in the bottom of the dish, it should fill the base of the dish and come up the sides. Arrange the other 6 leaves so they cover the sides of the dish, they should be fanned out, really overlapping and hanging over the edges. Using a third of the seasoned cabbage make a layer at the bottom of the dish and cover with half the sausage meat, pressing it down so it moulds in the dish. Repeat the process, ending with a third layer of cabbage leaves. Press everything into the dish. Fold and bring in the overlapping leaves to cover the top and make a neat parcel, dot with the remaining butter. Bake in a medium oven (180°/ 350F) for an hour. Remove from the oven and the allow the cake to sit for 5 minutes before inverting a plate on top of the dish and turning it on to a plate. Be careful and do this over the sink as there will be hot juices. Serve with creamy mashed potato and a dab of strong mustard if you like. I’ve had a French recipe similar to this one tucked away in my ‘to try one day’ folder for ages. Your beautiful essay makes me want to make it right now – delicious, elegant and comforting. Who could resist? Oh, Rachel — it is so beautiful! It truly does resemble an old, majestic oak tree. That looks so good. I’ve never seen anything like it! Bravo! Can’t wait to try this! Was tempted by the beautiful cabbage at the market the other day but didn’t have an idea of what to do with one! Thanks! This one’s a Big WOW. You are absolutely right–it is at once both peasant and elegant, with the opportunity for endless variations. 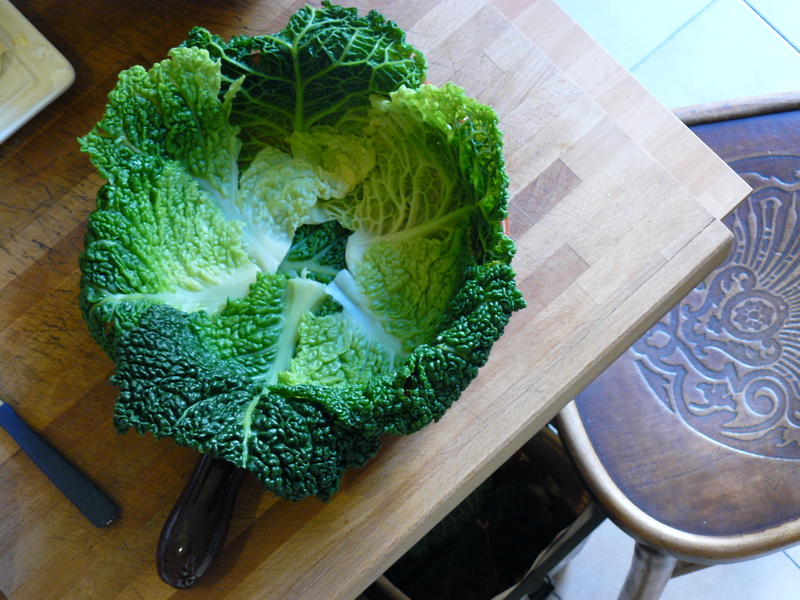 I have been cooking cabbage, usually a rumply savoy, into soups of late–adds such a nice sweetness. But never this–a totally new one on me. Just beautiful. The just-from-the-oven colors. The happy accident, cabbage transformed into a majestic oak. I miss cabbage. We don’t eat it. Roberto is not a big fan. It’s odd, but I can smell and almost taste it right now. My mother would adore this. Had she the recipe, I’m sure I would have endured many a dinner of cabbage and sausage cake in my early years. oh my gosh, how beautiful. i am bookmarking this, it looks delicious. You got me captivated at the buttery cabbage with chestnuts and crispy pancetta and then the cabbage and sausage cake looks really good. Then your brother’s suggestion of adding a layer of chestnuts and tomato sauce… I am salivating at the very thought. woah, what a beauty!! that might be the prettiest cake I’ve seen in a good long while. also wanted to tell you, we made some broccoli e pasta the other night. oh. my. a new favorite. I’ve already bought two more big broccoli trees so we can have it again this week. thank you rachel! WHAT? That is beautiful. It looks like cake and ice cream! J/k. Kind of. I want it. NOW! Rach, just read this entry. It reads so well, beautifully put together, just like the finished dish. I could not wait another day. I made my own majestic oak cake last night. We loved it. I used Toulouse sausage. It was delicious and it looked fantastic. Leftovers tonight. majestic oak cake – brilliant. that is what i am going to all it from now on. Yikes but this looks awesomely delicious! The possibilities for the filling seem endless…. And I very much covet your wood counters. I must agree that it was a very handsome looking cabbage! (it feels very wrong to type that!) 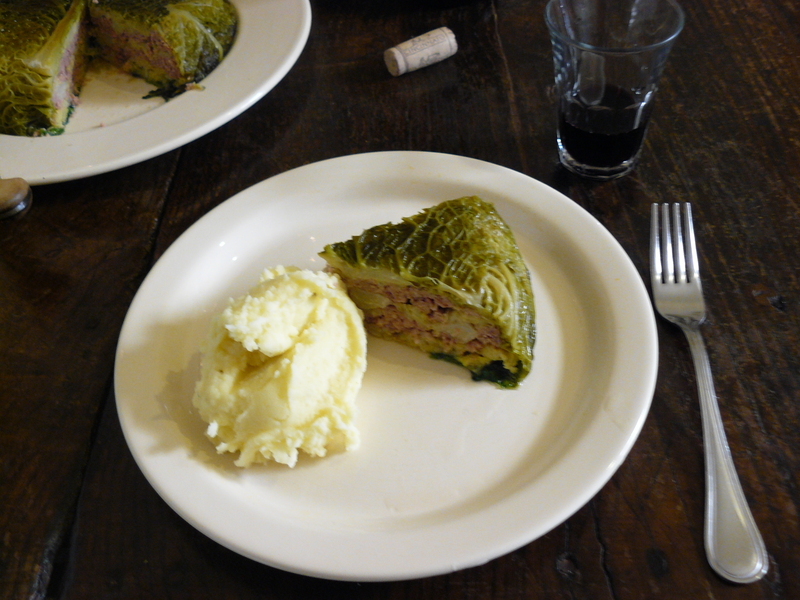 However the ‘cake’ looks and sounds delicious, I love cabbage, and sausagemeat so together what could be more edible! Hi Rachel! Love your blog so far! I can’t wait to try some of your recipes. But in the meantime, I was trying to find the RSS Feed button for your blog and couldn’t find one. Am I just not seeing it? hello, I am quite useless at technical things and I think I removed the RSS feed by mistake. I’ve tried to put it back and now I have strange new things on my blog and I’m not sure what they all do. I hope one of them is the one you were looking for. Gorgeous, gorgeous, gorgeous! I’d make this just to ogle it. Looks beautiful. I used to love Rowley Leigh’s recipes but then worked at Le cafe anglais as a waiter and was put off him rather. (We were never given any of the food to try, which waiters should experience if they’re to serve diners properly, and he himself wasn’t quite so charming as his columns seem — he turns out to be more of a socialite than you might imagine.) 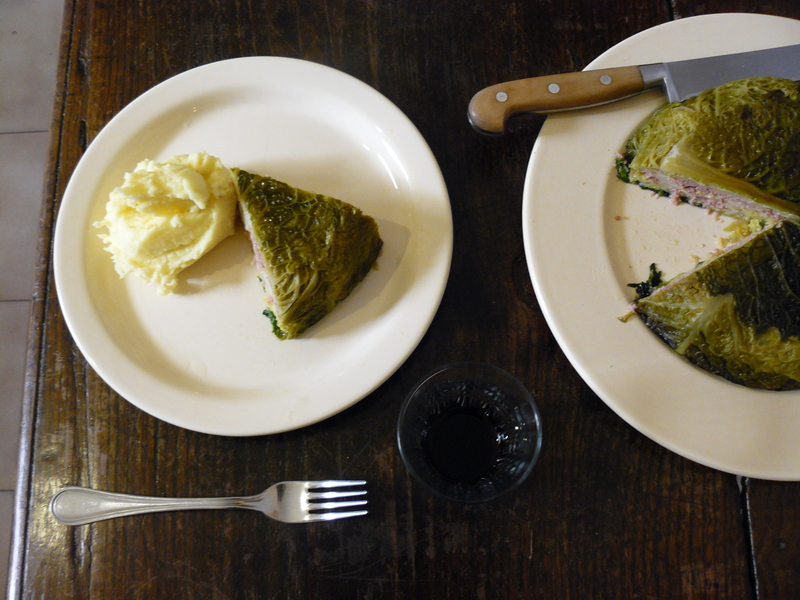 I don’t know if you ever get hold of black cabbage (Tat soi) in Rome but if so “Chez Panisse Cooking” has a wonderfully simple recipe for that. How very disappointing I had him down as really charming and very generous, the benevolent uncle type ! just goes to show ! I’ve been a waitress so I know the truth is out in such situations, another very popular chef writer was so nasty to me I cried and I never cry. Good timing, as I am waiting for the Chez Panisse cook book to arrive. I’ll head for the tat soi recipe when it arrives. as last night was another cold friday night in Rome (in Prati! ), I made your “majestic oak cake”. Hubby (German) said it is like deconstructed “Krautwickerl” and loved it (me too!). Just one minor thing: after 1 hour in the 180°C oven the cake was still not really done, the salsiccia was still pink and the cabbage not really through. We still enjoyed it a lot, but next time I’ll leave it in the oven longer or get the temperature higher. Yours really looks more done. Are you sure your oven is really 180°? his timings then adjust the post. Thank you for reassuring me you check your oven temps – that’s what I do, too, as you can never trust an oven 🙂 Oh well, who knows what air draft was going on, I’ll just let it in the oven a bit longer next time – and there will be a next time! This is absolutely remarkable! I haven’t seen anything as good as this in a very long time. From the perfect cabbage shape, to the fact that it slices like a pork pie with a cabbage crust, it defies superlatives. Delicious! 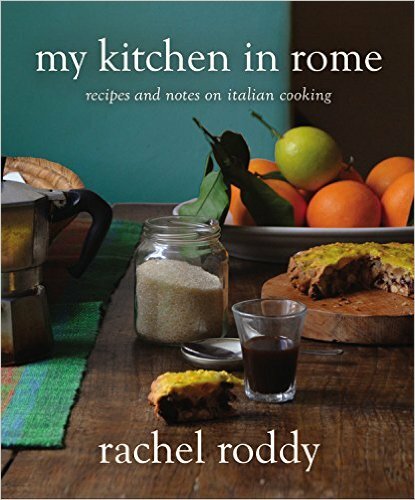 Made this last night (in Eur….so we’re covering all corners of Rome!) and the family loved it. Thanks for the inspiration. Cooking time and oven temp. were perfect. Thanks for your message and reassurance that temps/ time were right ! Most importantly, really glad you liked it. Right, cabbage has been bought and this will be tonight’s tea. Hope it works half as well as yours! It was very delicious, will be doing it again (and again) but I did manage to nearly drop it as it came out of the tin – so not quite as beautiful as yours and definitely not a majestic oak to look at, but it was to taste. I cut out this recipe when it appeared in the FT, and recently decided to make it — looked to see first if someone else had, and found your post, which was encouraging! It exceeded our high expectations…. It looks really great by the way. I stored this beautiful recipe away until I could figure out what a savoy cabbage was. I finally discovered one Sunday. I was so happy when I got a pretty tree at the end too. And perfect with spicy mustard. I am glad it worked and yes I agree lots of spicy mustard! Your majestic oak cake is known as a “Quatschkopf” (sillyhead) in the German Rhineland region and traditionally served with a sauce with caramelized chestnuts. I remember making it together with my mother and making a small one for myself and proudly eating it!